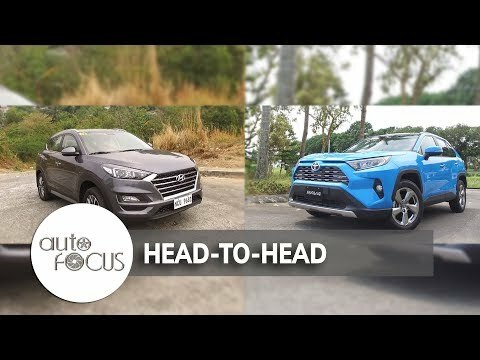 Auto Focus compares two automobiles from the same category to aid those who want an educated choice before making a purchase. What we have in this week's Head-to-Head are two cars that have undergone major transformations. Now bearing a number of changes and enhancements, both the latest generation Hyundai Tucson and Toyota RAV4 are ready to prove more than they already have. But in which aspects do they differ and come close? We'll find out. We have here the Hyundai Tucson GLS and the Toyota RAV4 2.5 LTD variants. Let's start with the powertrains of the two cars. Here we have the GLS variant of the new Hyundai Tucson. The Tucson is powered by an R 2.0 eVGT engine that produces 185 horsepower and 402 Nm of torque. Meanwhile, the Toyota RAV4 runs on a 2.5-L Dynamic Force Engine with Dual VVT-I that produces 203 horsepower and 243 Nm of torque. Both of the two vehicles' engines are mated to an 8-speed automatic transmission. For the suspension system, the Tucson is with MacPherson Strut Type at the front and Multi-Link Type at the rear. On the other hand, the RAV4's suspension features a MacPherson with Coil Spring at the front and a Double Wishbone with Coil Spring at the rear. Let's proceed to the exterior design of the two cars, which both have gone through transformations. The latest generation Tucson showcases a redefined Fluidic Sculpture 2.0 design language. It comes with a bigger hexagonal chrome-plated grille, which is further framed by a set of high-tech headlamps. Over at the rear, the taillights are still present, though the reflectors have been positioned higher. Aside from these, the Tucson comes with 18-inch alloy wheels. On the other hand, the fifth-generation RAV4 features a more aggressive look, courtesy of the Toyota New Global Architecture or the TNGA platform. The same with the Tucson, at one glance, the changes are apparent and you could point it out easily. For the RAV4, it's the "cross-octagon" style, which combines a wide wedge-shaped front that links with an octagon-shaped spacious and utilitarian rear. Moreover, the RAV4 is has two-tiered upper and lower trapezoid-shaped grille that comes with LED headlights. On top of that, just like with the Tucson, the RAV4 runs on the road with a set of 18-inch alloy wheels. It's time to hop on inside the two cars. Stepping inside the Tucson, it seems like Hyundai did a lot of major changes. The dashboard feels neat, with the infotainment system looking like it's floating. The cabin is made simple as well, plus the buttons and controls aren't confusing and hard to reach for. The center console comes with a storage box with armrest cover and cup holders. In addition, the Tucson offers a lot of space for the passengers. Everything is wrapped in leather, providing more comfort. The driver seat comes in 8-way and 2-way lumbar support while the rear seats offer 60:40 split folding with center armrest and more cup holders. The backseats are foldable if ever you're in need of additional cargo space. Furthermore, as mentioned, the infotainment system is the highlight of the Tucson's interior. It comes with a 7-inch seven-inch touchscreen display that also works as a rear parking camera with sensors. It is equipped with 6 speakers and is available through Bluetooth, USB, and AUX-in connectivity. Let's go check the RAV4's interior. The interior of the RAV4 looks all fresh and new as well, the same with its exterior. The cabin features a rugged dashboard soft- touch panels. The seats are wrapped in leather as well, making it comfortable to sit on during long drives. Just like with the Tucson, the driver seat is 8-way power adjustable that also comes with memory and lumbar support. In addition, the RAV4 also has an inside rear view mirror. Moreover, the seats are wrapped in leather, providing comfort to the driver and passengers. The driver's seat is 8-way power adjustable that also comes with memory and lumbar support for added comfort and convenience. The RAV4 also has an inside rear view mirror. Additionally, the interior of the RAV4 is further highlighted by seat heaters, rear cooler, and a panoramic moon roof. Also, at the heart of the cabin is a 7-inch multi-information display that supports AM/FM radio, Bluetooth, USB, and AUX connectivity. It also features a smartphone mirror link for Android and Apple. When it comes to safety and security, both the Tucson and the RAV4 don't fall short. The Tucson is equipped with dual airbags, and Anti-Lock Braking System with Downhill Brake Control and Hill-Start Assist Control, among other features. Meanwhile, because of the TNGA, the RAV4 has a number of more advanced features. Apart from the standard ones, the RAV4 is equipped with 7 airbags, 8-eye front & rear sensor, back-up camera, anti-lock brake system with emergency brake signal, and Vehicle Stability Control. Those were the 2019 Hyundai Tucson and Toyota RAV4, two cars that are equipped with features and details that make car enthusiasts excited to drive them. We hope you know now which of the two you prefer. That's it for our Head-to-Head this week.